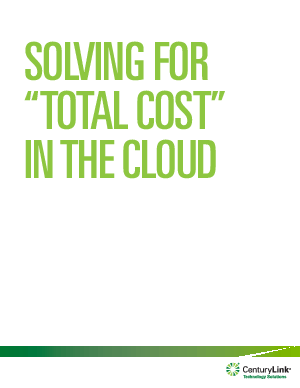 > CenturyLink > Learn how to avoid hidden costs in the cloud. Don’t be blindsided by your cloud bill. Keeping TCO low in the cloud is essentially a matter of management strategy. IT managers ‘in the know’ are all too aware that the “cheap virtual cores!” pitch can be anything but cheap for overall business. True enterprise clouds that can handle an organization’s needs require a cloud provider with an all-in, integrated offering that gives you the set of services you need to deploy and maintain a robust, connected infrastructure. Download “Solving for ‘Total Cost’ in the Cloud” now – and learn how you can build an effective cloud management strategy that keeps costs down and business up.